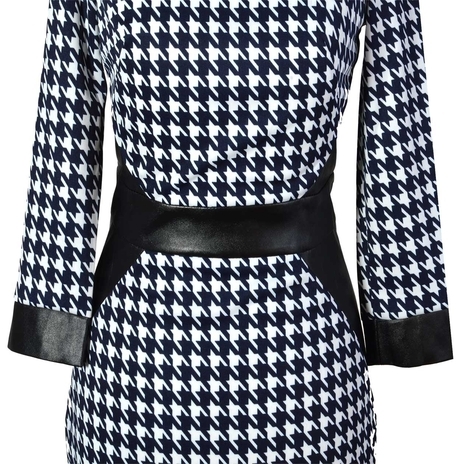 A stylish houndstooth petite dress in a stretchy fabric with PU leather detail to accentuate the waist. COMMENTS : Generally I like the idea of this dress. I'm not overly keen on PVC leather though as I think it can look very cheap and once you get past a certain age that should be a no no. COMMENTS : Great to see a printed dress on Jeetly. Lovely style, certainly IN for me. COMMENTS : Love it! Worried about the faux leather though. Will it look genuine enough or will it look cheap? COMMENTS : Very striking. I would be tempted by this one. Note it would have to be machine washable, or I would not consider it. 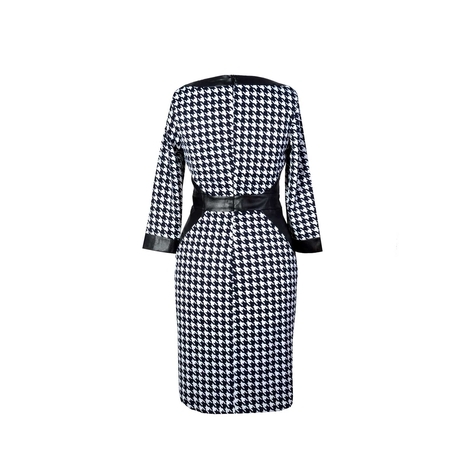 COMMENTS : I absolutely love this dress; I find it very difficult to find a long sleeved dress. I love the shape. COMMENTS : Love love love it! Will totally buy it! COMMENTS : So excited to see a patterned dress with longer sleeves. I can wear this at work. I hope it get produced, because i will definitely buy this. COMMENTS : Looks classic and elegant like everyone else has said so far! COMMENTS : I like the idea of this design. COMMENTS : I would love to wear it during my upcoming seminar. Will you have it ready by 2nd December?